earlier this year, we introduced bots. Bots provide a conversational way for you to connect to services in Chat, such as looking up information, scheduling meetings, performing tasks, and so on. Bots can be created by Google, users in your domain, or third parties. We’ve heard from you that you’d like more granularity over which third-party bots your users can interact with in Chat. In addition to the option in the Admin console to turn bots on or off for your domain, you can now enable specific third-party bots individually in the G Suite Marketplace settings. Full instructions on how to whitelist bots can be found in the Help Center. While you can start adding bots to a whitelist now, this new setting won’t take effect in Chat until October 10th, 2018. This means that if you have previously disabled all G Suite Marketplace apps or whitelisted specific apps, the Google Drive bot, Meet bot, and third-party bots will stop working unless you change your G Suite Marketplace settings to allow these. For more information on using bots in Chat, check out the Help Center. 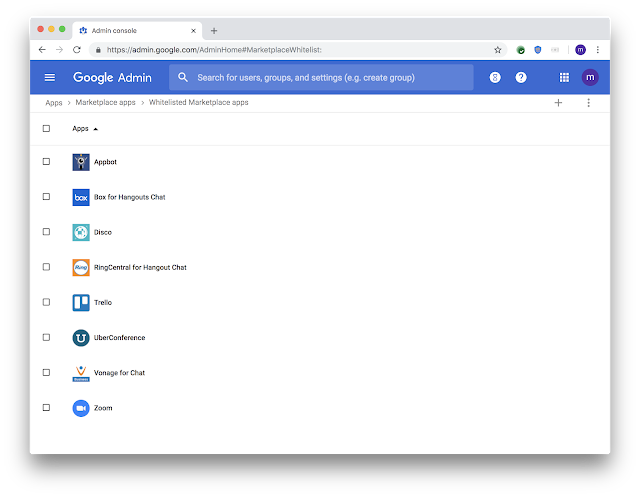 We’re adding the option for you, as a G Suite admin, to whitelist specific bots for Hangouts Chat for your organization. This new setting will apply in Chat beginning October 10th, 2018. When we announced Hangouts Chat earlier this year, we introduced bots. Bots provide a conversational way for you to connect to services in Chat, such as looking up information, scheduling meetings, performing tasks, and so on. Bots can be created by Google, users in your domain, or third parties.